Al Sandoval placed FIRST in the Adonis Index Contest in the transformation category. Al found a way to lose fat that he put on in the last 20 years. 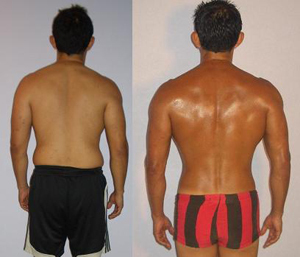 At the end of 12 weeks he managed to beat everybody else and win the whole transformation contest. Al's back looks really good, his back muscles are starting to show up. And he finally god rid of the love handles or how he calls them the hate handles. Al's front pictures. He is obviously very satisfied with his transformation. Well, who wouldn't be, he got in a great shape. Al is somebody who was used to follow the conventional fitness advice. However, after his wife Naomi got in shape with the Venus Index all the proof he needed was right in front of him and he could no longer say that what she says doesn’t work. She proved him that what he was doing was not working and that she knew what to do to get in shape. She showed him that what he hears in the gym and on TV is not really true. And he could not really argue with her since she got in shape and he still looked the same. His wife made him to be honest with himself. Al would always carb up before the workout and that was what he believed would help him lose fat and build muscle. After his wife told him that is not true, he asked what he should do instead. The answer was something that he didn’t want to hear. From the fat loss stand point it all got down to diet. He was scared of dieting. He didn’t know what being in deficit means, he also didn’t know what this would mean in the gym. Would it mean that he won’t probably be able to hit the same weights in the gym that he normally does? That would not be so much fun anymore, would it? Well, it came down to what he truly wanted and losing fat won. Losing fat may be simple, but is definitely not easy to do. And once you gain some fat, you have to diet otherwise you will carry it for the rest of your life. There is no accidental fat loss. If you were slowly gaining fat for the past 20 years it will obviously take some effort. This is was exactly were al was before the contest. Once his wife started coaching him and he was doing what she told him, his body was slowly transforming and he was getting in shape. His wife Naomi who already had this handled introduced him to intermittent fasting by simply telling him to skip breakfast, lunch and eat only dinner. Because she was always cooking for him, she made sure he had a low calories dinner after each fast. This way he had only several hundred calories each day he would fast. Then he would throw in few maintenance days just to keep sane during the whole 12 weeks. Then for the past 10 days he was drinking a gallon of water each day and eating only tuna and sweet potatoes. 12 weeks of dieting is tough and most people won’t do that. However, it is worth noting that most people are not in good shape and will probably never look like Al. He started following the Adonis Index Workout and found out that it is all based on math and science and since those two don’t lie it must be true. And after 12 weeks of following this approach that also seemed most logical he arrived as a winner in the Adonis Index Contest. The only problem he encountered was that the dieting was so hard that Al had to stop working out three days before taking the photo shoot, because he just didn’t have enough energy for it. Now he doesn’t care what other people in the gym are telling him about bulking up and carbing up, because it all comes down to how you look and since he looks ten times better than his buddies he choose to stay away from their influence and do what he knows works even though it goes against what everybody else is saying. Once Al took those pictures he was surprised how good he looks and that he finally got rid of his love handles or how he calls them the hate handles. Because even though we don’t see our backs much often, other people do. And know like Al said he can enter the room looking good and leave the room looking good as well.